We're on our way home from Jeff & Evelyn's wedding in New York City. It was a gorgeous event which I hope met all of their expectations. For us, the event began on Wednesday, 5 November. Steven, Mom & Dad boarded American Airlines flight 728 from DFW to LaGuardia. I was able to book them into first class seats which (I hoped) would greatly reduce the stress of traveling. I was in Philadelphia working and joined them in NYC on Thursday evening. Our rooms were in the New York Hilton on Avenue of the Americas, just blocks from the Ed Sullivan Theatre from which Late Nite with David Letterman is broadcast. On Friday, we went to the rehearsal at The Riverside Church. This is a magnificent building which once was a Baptist Church but is now interdenominational. In fact, it appears that John D. Rockefeller, Jr. was a member and contributed significantly to the Church. After the rehearsal, we went to Cxxxx's Cafe for an intimate dinner with the immediate family and wedding party. Saturday morning, Mom and I dressed at the Hilton and then took a taxi to Affinia Manhattan where Evelyn had booked a small suite. Her hairdresser and a make-up artist were there to help all the women get ready. The hairdresser worked wonders with everyone's hair and she took on my long and heavy mass without fear. She put it up into a very tidy bun that amazingly did not feel heavy and pull against the back of my head. I had already put on basic make-up, but did ask the expert to help with eyeshadow. After all that, I do have to admit I looked the best that was possible! 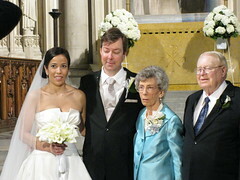 Piling into a stretch limo with Evelyn, her bride's maid, sister, mother, mother-in-law, and the photographers, we were borne efficiently—if not too quickly given traffic in Manhattan—to Riverside Church. The ceremony went off without a hitch. Vows were given; rings were exchanged. Documents were signed. Photos were taken. While the photographers took the newlyweds outside to catch the remaining daylight of what was a gloriously bright and sunny day, the rest of us headed up to the ninth floor and the reception. To keep the guests busy until the bridal couple arrived, drinks and appetizers were served. Heck! It was enough to make a whole meal and there was dinner yet to be served. Finally, Jeff and Evelyn returned and were introduced to the gathered family and friends. Evelyn was still wearing her wedding gown which had a VERY long train and even longer veil. They danced their first dance as husband and wife, visited with well-wishers and then Evelyn escaped to change into a beautiful (but shorter) dress. Us old folks called it an evening shortly after the cake had been cut and passed around. And now, we're seated on American Airlines flight 731 winging from near perfect weather in NYC to almost identical conditions in Dallas.